Applying for a job, completing the evaluation and sending them your resume are just a few steps towards being actually selected for a job. The next and most important step is the personal interviews where a candidate will be tested and evaluated if they are right for the job or not. It is therefore an advisable plan for anyone going in for their personal interviews to prepare for the kind of job interview questions that the interviewers will ask and more significant will be the answers that you provide for each question. Giving the prospective employers a good impression on what your capabilities are is essential and what better way to do that than going to the interview prepared and armed with your best personality. These MBA interview questions and answers types are being divided into the different topics that specifically covers MBA finance. Here are the questions asked in finance interview for freshers that falls under this category. The finance questions that usually comes when it comes to this categories are what are the various types of accounting, characteristic features, cost accounting and the objectives of it, defining management accounting and its objectives, the scope of management accounting, comparison between financial and cost accounting, between financial and management accounting and the comparison between management accounting and cost accounting. These are basic general accounting questions that would need answers from you, in an MBA finance position interview. Another type that is covered in the MBA finance interview questions are; defining personal accounts and listing the different accounts within personal accounts, explaining the meaning of real accounts and providing a list of real accounts and how these can be used in real time, Definition of nominal accounts and listing the different types of nominal accounts, the principle of double entry system of accounting, explaining what a trial balance is and what does an accurate trial balance suggests. These are basic text book questions but one needs preparations so that it shows that you know the subject. Questions that comes from about Journal are, defining journalizing and breaking down the columns of a journal, subsidiary books and why these are maintained, listing the type of transactions that are entered in a journal, what is a cash book, defining a purchase day book, sales day book and the importance of both, purchase return register, sales return register and defining journal proper. These are questions that will need the basic textbook answers. Listing and explaining the different types of expenditures that are relevant to accounting, capital expenditures, defining revenue expenditure and its effect on the profitability statement in a period, deferred expenditures and how deferred expenses are taken care of in a profitability statement. A short and concise answer should do fine. Definition of a ledger and the meaning of a ledger posting, the meaning of controlled ledger and the purpose of maintaining one and what it means by the balancing of ledger accounts; these are the questions that are enclosed within the category. Answers that are straightforward and basic textbook guides will be able to help you answer these. The definition of depreciation and the cause of depreciation, the need of a depreciation account, the effect of depreciation of assets on profits received by owners, the different ways of calculating depreciation and the straight line method of calculating depreciation, written down value method of calculation, production unit method of calculation, the annuity method of calculating depreciation, sinking fund method of calculation, revaluation method of calculating depreciation and the different acts on the calculation of depreciation. The definition of the bank reconciliation statement and why is it prepared, tallying of the bank pass book and your bank book and the things needed while preparing a bank reconciliation statement. Explanation of a balance sheet and the need for preparing it, items appearing on the liability side of a balance sheet, items appearing under the assets, the adjustment entries and why these are passed and the entries that are needed for the preparation of the final accounts. The need for preparing the profit and loss accounts and the components of profit and loss. The answers to these are all basic textbook definitions. Meaning of accounting concepts, the different types of accounting conventions and the various systems of accounting and explanations of each. Groups that are under rectification of errors, types of errors that have an effect on the trial balance, the type of errors that do not affect trial balance, steps to locate errors in case there is a disagreement in the trial balance and measures to rectify these errors. The questions that comes under this category are: the definition of cost accountancy and the objects of cost accountancy, cost centre, the comparisons between impersonal and personal centres and between production and services cost centres, the definitions of direct and indirect costs, variable, semi-variable and fixed cost, controllable and uncontrollable costs, normal and abnormal costs, opportunity and differential costs, sunk costs and steps involved when installing a costing system. The different elements of cost, overheads and how they are being classified, factory overheads, office and admin overheads, selling and distribution overheads, the definition of gross and net profit. Definition of budget and its characteristics, budgetary control and its characteristics, the advantages of a budgetary control, prerequisites of implementing a budgetary control, cash budget, purchase budget, production budget, define a budget manual, difference between a fixed and a flexible budget, role of a budget control in cost control and the requirements for the success in its preparation. The interviewers will not be asking just the specific financial analyst interview questions that are related to MBA, there will be questions that will be personal and general which will help the hiring panels to evaluate if you are fit for the position in their company or not. The specific questions are the easy part of getting through the personal interviews and as a fresher, there is a huge likelihood that you can still remember all the answers to the questions above. The first thing that the interviewers will want to know is about you, so the best way to tackle this answer is by being honest and straightforward. Be clear about who you are, what you like and the kind of challenges that you are always looking forward to when it comes to searching for a job. The secret is not repeating what has been written on your resume; make sure that you also tell them about your educational background, the extracurricular activities that you care about and your strength as an individual (something that is not about your professional life). This is your first step at giving the interviewer a solid first impression. Another important question that the interviewers are going to ask you is the reason why you are applying for that particular job. It may be any of your expectations from the job, maybe because it fits your skills because it is something that you love or just because you really need the money. The best answer for this kind of question is ensuring that you are interested in the work; again this should be backed up by the fact that you have the skills and the knowledge for doing the necessary work. It is important to answer this question with the knowledge of the job applied for. Your resume is a very important part of your interview and it is advisable that you are able to explain what was written in the resume, whether in a detailed description or as a summary; this will depend on what your interviewers want to hear. They will want to see how you communicate and present your accomplishments and accolades, this is also another way of reading the level of your confidence and knowledge on the skills and educational background that you have. The best answer is a quick summary of your resume that is presented in a confident and gives them the impression that you know what you have written about and your skills. A very important information that the interviewers would want to know is your reliability. They will want to know whether you are going to work for them long term or if you are already thinking about moving to another company that has greener pastures. This is also a great way for the interviewers to know if you are focused and a person who has aims. The best way to tackle this question is in being honest and let them know your dreams if you are looking forward to fast promotions that will show your commitment to growth, and it shows that you are also result oriented and therefore ready to learn how to be successful. Knowing what the company you are applying into will surely give you plus points because the question about your knowledge of the company will be asked. It is good to be prepared and let them know all that you have learned about the organization. This shows commitment and that it is actually in your preferences. Going in without knowing the core services of the company will kill the interview even before you are able to make that good and solid impression. It is always advisable to be able to answer this question favorably as this is your way of showing that you know what you are getting into and that is why the job application. This is a very common question in most personal interviews; they will be interested to know what was the reason for you to choose this line of studies. A great way to know your focus on the future, career and a great life, this is also a great way to see your knowledge of your educational background. The way to tackle this question is by being completely honest with them and tell them your end-game (because you want to be specific that this path is going to give you), let them know your strategy and the reason why you took MBA to get to your dream. In the corporate world, it is a huge thing to be able to carry yourself. This is another information list that is going to be important for your prospective employers to know. Understanding your strengths and weaknesses is a sign of personal maturity and a focus that will be very advantageous for the company. It is advisable that you educate yourself on the SWOT model before the interview and being genuine about yourself is the best way to get through this answer. Do not over highlight your strengths or contradict between the two and the most important is in hiding your weaknesses. Share whatever is comfortable to you. However, do not add to any of the points given. Personal interviews are very scary and are a lot of hard work – just remember that the result from all the hard work is your first step towards being successful with your dreams. 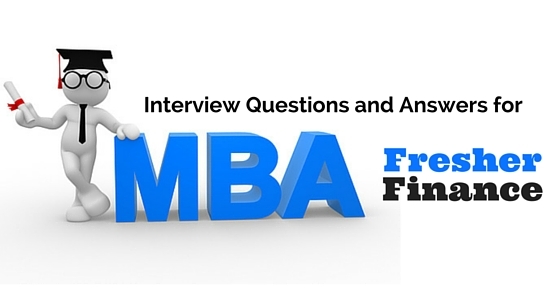 Generalized and personal questions will need a lot of focus and honesty while specific MBA finance interview questions will be easier with you being a fresher just fresh out of your studies; just remember to brush your knowledge before the interview.